This word was misinterpreted by Euro-Americans as “Crow.” Today, 85 percent of the tribe speaks Crow as their first language. Originally, there were three bands of the Crow tribe: the River Crows, who inhabited the territory along the Musselshell and Yellowstone rivers; the Kicked-in-the Bellies, the band that frequented what is now Wyoming’s Big Horn Basin—where Cody sits; and the Mountain Crows, who frequented the upper Yellowstone River in central Montana and Big Horn Mountains of north-central Wyoming. Known as warriors, militaristic endeavors were essential to becoming a Chief and leader in Crow Nation. Four acts of bravery and display were required for leadership, these achievements reflecting divine guidance and grace. And one had to lead a successful war party and demonstrate leadership in a demanding situation. After these feats were accomplished, it was still necessary for the larger group to decide from the pool of candidates who would lead. Dr. Joe Medicine Crow, Ph.D., advisor to the Plains Indian Museum, accomplished all four of these feats during World War II, and has written about it. The Apsáalooke experienced smallpox epidemics 1840 – 1850, suffering a staggering population loss from about 10,000 people in 1830 to less than 2,000. The Crow’s familial system is matrilineal, meaning lineage is traced through the mother and is based on clans. A clan is a close-knit group of inter-related families. The present-day clan system is derived from the 13 original clans of the tribe. The Crow Reservation was first defined as 38 million acres by the Treaty of 1851, negotiated with U.S. government representatives at Fort Laramie, Wyoming. 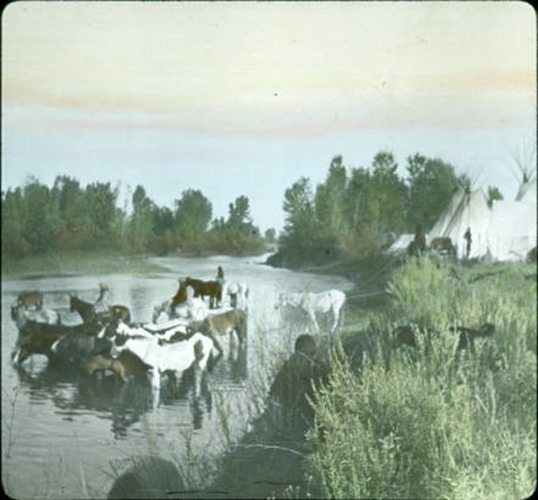 By the Fort Laramie Treaty of 1868, Crow lands were reduced to eight million acres. Land holdings were further reduced by several acts of Congress and railroad rights-of-way—that were disputed by the tribal leaders due to lack of payments—until 1904. Today, the Crow Indian Reservation is headquartered in Crow Agency, and encompasses 2.2 million acres in southeast Montana. 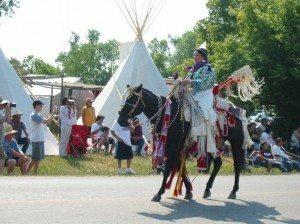 Tribal enrollment is currently about 11,000, of which 7,900 people reside on the Crow Indian Reservation. 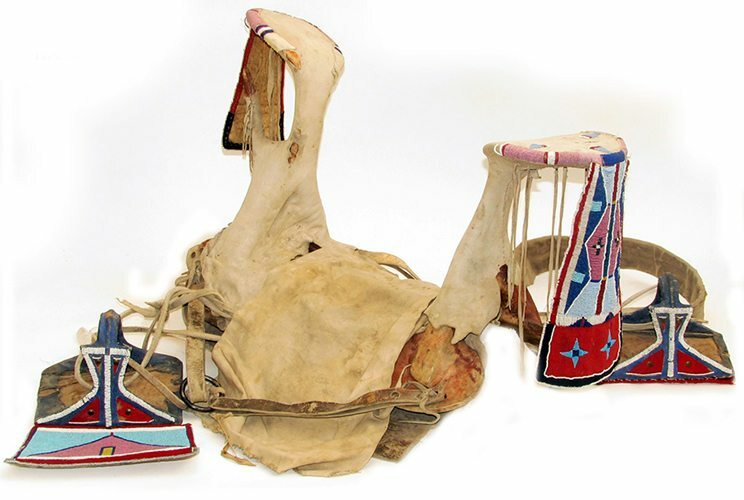 This graceful and ornamental woman’s saddle is derived from a Spanish/Moorish style, and adapted to Native materials and modified to suit the tastes of the Northern Plains tribes. 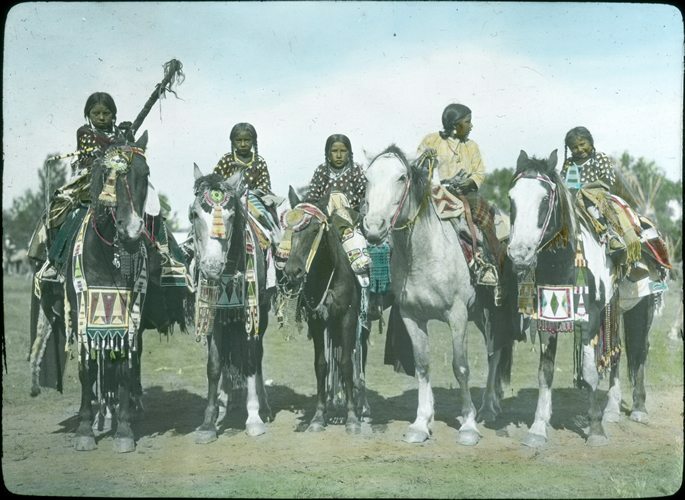 Highly prized by the Crow, the decorated saddles—as well as beaded stirrups, bridles, martingales, and cruppers—were used on dress occasions on women’s horses (as noted in the image of the five Crow girls). The pommel (front) and cantle (back) are made of cottonwood, soaked and split into reversed Y-shapes. The tops were carved into flat horizontal discs from which hang the beaded and wool cloth-covered tanned hide flaps. The upright frame is attached with hide strips to wood slat side pieces, and the whole body is covered with rawhide applied when wet, then tightly stretched so when dry it forms a tight casing. This is then covered with tanned hide. A prong of deer antler is inserted in front of the pommel, and an iron ring is added to the commercial tanned hide girth. The flaps are decorated in glass seed beads in bold, simple geometric designs in a dark blue background with white outlining and filled with a variety of pastel shades, as well as two four-point stars in shades of blue. 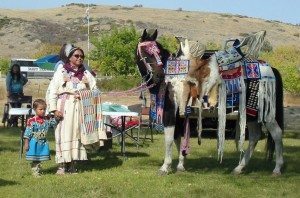 Crow women still dress up their horses today in such finery to ride in the annual Crow Fair at Crow Agency, Mont., (as in the images below). The horses are bedecked with lance cases, Navajo or Pendleton blankets, beaded cradles and painted parfleches hang from the saddle with, sometimes, an elk tooth dress over the horse’s flanks. 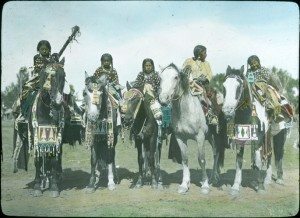 Crow Nation’s pride in horses stems from their longstanding reputation for owning the finest and largest herds on the Plains. In the height of the horse raiding days during the first half of the 19th century, it was not unusual for a Crow warrior to acquire a herd of 200 animals.